Integrity … class … astute … respect … builder … never afraid to go all in with stunning blockbuster deals … synonymous with hockey but passionate for sports, including a very soft spot still in his heart for the Montreal Expos. Those are but some of the aspects that come to mind when thinking of Cliff Fletcher. He built the Flames from their NHL inception in 1972 and guided them through their move from Atlanta to Calgary in 1980. He continued to lay down the foundation for one of the NHL’s most dynamic clubs during those exciting Battles of Alberta in the 1980s, culminating with the organization’s first Stanley Cup victory in the fabled Montreal Forum in 1989. He moved to Toronto in 1991 and immediately restored the passion in the Maple Leafs, guiding them to successive Conference Finals in 1993 and ’94. And he remains closely aligned to the NHL where he has been Senior Advisor for the Leafs since 2008. Born in Montreal, Fletcher’s tutelage in big-league hockey started in 1956 and spanned a decade scouting for the Canadiens under crafty Sam Pollock. Those Habs won an unprecedented five Stanley Cups from 1956 through ’60 and added others in 1965 and ’66 before Fletcher headed to the expansion St. Louis Blues as a scout and assistant GM in 1966. But it was would be over his 19 years as GM of the Flames that Fletcher took the lead role engineering big, highly skilled and contending clubs. The Silver Fox and Trader Cliff were nicknames he picked up along the way, showing that he wasn’t afraid to wheel or deal – and shoot for glory regardless of the consequences. His acquisition of Lanny McDonald in 1981 and Doug Gilmour in 1988 brought the Flames two keys to their Stanley Cup title. He wasn’t done dealing for Gilmour as Fletcher’s trade with Calgary in early 1992 changed the fortunes of the Leafs. 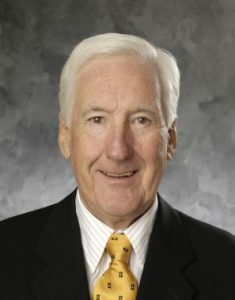 Fletcher’s outstanding career was recognized by his entry into the Hockey Hall of Fame as a Builder in 2004. Now 60 years after he launched his NHL odyssey with the Canadiens we bestow another honour upon him. We congratulate Cliff Fletcher – an extremely fitting and deserving inaugural recipient of the Conn Smythe Lifetime Achievement Award in recognition of his significant contribution to Canadian sports!